jewelry was the 19th century. The following article provides a general idea of the styles, influences and materials used during this fertile century of jewelry design and production. 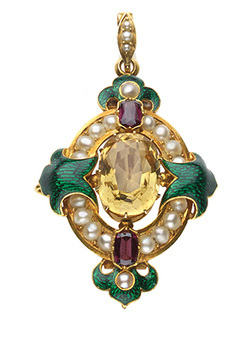 The 19th century was a period of enormous industrial and social change, but the jewelry produced is characterized by a stylistic eclecticism that takes its inspiration from nearly all past styles, beginning with the neo-Gothic revival around 1820, to the neo-Renaissance and neo-Baroque influences, to Louis XVI, right up to the 1890s and the beginning of Art Nouveau. The Louis XVI style retained its appeal until shortly before World War I, while the Art Nouveau movement that began in the mid-1890s ended in about 1910, when it gave way to Art Deco. For the jeweler, who wanted to borrow motifs from earlier centuries, this was made easier because of the existence of pictorial records and pattern books. In the 19th century, jewelers continued to draw on Renaissance sources until the 1870s. The jeweler used whatever motifs he considered necessary, including interlaces, sinuous plant forms and grotesques that were freely mixed with later ornaments. These were generally not taken from Renaissance pattern books but from popular compendia of the 19th century. In England, Typical examples of this style are the so-called “Holbeinesque” pendants. Starting in the 1850s, 18th century pattern books began to circulate, and these dealt more with flowers, wreaths, garlands and vases. At the beginning of the 19th Century, when Prussia rebelled against the Napoleonic occupation, money was badly needed so patriotic women were persuaded to exchange their gold and precious jewels with iron jewels, produced in Berlin from 1804. This “Berlin Iron” jewelry was very much in vogue. Soon after the war, this type of iron jewelry was produced in France in fashionable designs inspired by neoclassical motifs. This period also saw the rise in popularity of cameos set in gold as well as steel used in jewelry. The metal was faceted and polished as a precious stone. Marcasite, a form of iron pyrite, which came mostly from Switzerland, was used as a substitute for diamonds, due to its high metallic luster. Sentimental and memorial jewelry was also in high favor as were small lockets containing a lock of the beloved’s hair. Also popular was jewelry made of stones, whose initial letters spelled out a name or made up intimate mottos. And of course, we cannot forget the use of jet—used especially during periods of mourning—as well as rock crystal, pearls and just velvet ribbons that decorated the neck and the wrists. Probably the most important feature of 19th century jewelry was that jewelers began setting diamonds in open collets or claws. Diamonds (old-mine and European cuts after 1840) began to be placed in open mounts, while smaller stones, rose-cut diamonds and most colored gems continued to be set in closed mounts. From the beginning to the end of the 19th century, diamonds were mounted in a combination of silver and gold. Silver was used at the front to enhance the whiteness of the stones, while gold was used at the back and top for sturdiness and to prevent any interaction with the skin or clothes. In addition to diamonds, other widely appreciated stones were amethyst, garnet, topaz, turquoise, peridot, coral, chrysoberyl, aquamarine, and pearls. Also characteristic of this period were the various colors of gold that were used, including red, green and yellow. In terms of style, the simple nature-inspired themes of the 1800s became more elaborate after 1830. Simple leaves and flowers turned into striking roses, fuchsias, cornflowers, ears of wheat and leaves of all kinds. Scrolled tendril motifs, the fine gold wire cannetille decoration, ribbon bow motifs, girandoles and, of course, filigree styles reached their peak. Saints, angels, putti, the curved ogives, gothic motifs, fantastic creatures, snakes, gloved hands, hearts were also very popular. Around 1820, enameling was incorporated into jewelry with techniques such as champlevé and plique-à-jour becoming the trend of the times. In the 1830s, the unexpected discoveries of Etruscan tombs around Rome, Pompeii and Herculaneum unleashed a craze for archaeological-styled jewelry. The most famous jewelers answering this fashion were Castellani and Carlo Giuliano. Creating large numbers of glass micro-mosaic pieces and coin jewelry, they satisfied the demands of the rapidly expanding tourist market in these regions. ​ During the second half of the century, Eugénie, the wife of Napoleon III, who favored 18th century fashion, engaged the jeweler, Babst, to remount some of the Crown Jewels in the style of Louis XVI and Marie Antoinette. This brought back into fashion elements of that period. Influences of the Middle Ages, Renaissance, and Greek and Etruscan classicism, as well as archaeological revival jewels, continued to be appreciated through the 1870s. The beginning of the great World Exhibitions in London in 1851, followed by Paris in 1855, provided the most important forums for the display of new work, including jewelry design. Vast numbers of artifacts were assembled for “The Great Exhibition of the Industry of All Nations.” In an area covering 19 acres in what was subsequently known as the Crystal Palace, the wealth and cultural diversity of the British Empire and beyond was put on display for the benefit of well over six million visitors. The Great Exhibition gave scores of international jewelers a unique platform to showcase their artistic creations. After 1860, the Egyptian revival style joined the popularity of the current jewelry fashions, soon to be followed by designs influenced by China and Japan. Following expeditions into China and the opening of Japan to western trade, a number of jades arrived in Europe and the study of Eastern cloisonné enamel led to the use of new techniques and motifs involving birds, butterflies, bamboo, flowers and insects. Novelty pieces such as horseshoes, fox masks, riding cups, bridles and intaglios also became popular and continued to be used until the World War I. Also very prized during this period were designs in the form of dragonflies, spiders, flies and wasps, mostly set with multicolored gemstones, as well as stars and crescents in every size and style. Motifs involving elephants, tigers, exotic flowers, birds and other animals—mostly coming from India—were used with green Pertabghar Enamel. Mechanically produced and affordable jewelry was produced starting in the 1850s, but lacking in quality, it fell out of favor by the end of the century. In the early 1870s, Henry D. Morse and Charles M. Field invented the bruting machine, a major innovation in the history of diamond cutting, and patented steam-driven bruting machines in Britain in 1874 and in the USA in 1876. The first electric bruting machine was invented in 1891. These two inventions gave birth to commercial applications to create the first truly round brilliants. This era was also one of prosperity, economic growth and confidence in which a burgeoning middle class had enough disposable income to to afford a diamond ring, a star brooch or even a diamond tiara. While daytime jewelry was small and delicate diamonds almost disappeared, the formal evening occasions were a whole other story. For grand balls and other events, beautifully made ornaments, set with high quality stones, became the norm. For those who could afford them, diamonds were readily available, sourced from the recently discovered fields in Kimberley in South Africa. Colored gems—especially ruby, sapphire, turquoise and opal—were traded by international gem merchants. New deposits of gold and silver were discovered as far away as Australia and North America. Short-lived but truly magnificent, Art Nouveau jewelry started to appear in the early 1890s and ended around 1910. Nature and femininity were among the most powerful trends of the 19th century, but it took on a totally different aspect in the Art Nouveau movement. The motifs were exotic flowers, dragonflies, snakes, peacocks, swans, swallows, spiders, fairies and other fantastic creatures. Full of life, fluidity and movement, they became symbols of life, eternity, sexuality, birth and death. Art Nouveau became emblematic of a woman’s profile and her naked, sensual body. Materials to create these fluid pieces were selected for their artistic merit and not for their intrinsic value. Opal, chalcedony, chrysoprase, agate, moonstone, pearl, horn and enamel were the major materials, rather than diamonds and colored gems. While mass production was inevitable thanks to the use of new technologies, the 19th century also saw the arrival of large commercial firms that produced high-quality and expensive jewelry suited to the requirements of the prosperous new bourgeois class. Some of the most important of these firms are: Castellani, Carlo Giuliano, Eugène Fontenay, Boucheron, William Burges, Tiffany, Alexis Falize, Vever, Mellerio, Jules Wièse, Aucoc, Lemmonier, Froment-Meurice, John Brogden, Robert Phillips, René Lalique, Fouquet, Gaillard and Gautrait. While many of these names continue their remarkable heritage today, others are less well known. Because the popularity of antique jewels has spawned many copies and forgeries, it is important to learn about the pieces and also to have confidence in the dealer.